Infrared SOLAS tags are black when viewed with normal light, but when you look at them with Infrared goggles or infrared camera the tag glows brightly. You can Identify specific animals by writing information on the tag with a black marker. Black marker will not show up on the black tag so only persons with night vision or infrared camera will be able to see it. We also have Permanently numbered tags and custom printed tags. Infrared SOLAS Animal ID tags are completely water proof and are designed to mark an animal for night-time identification. 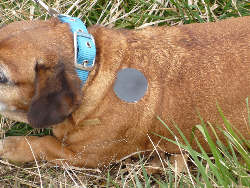 Once you have captured the animal you wish to tag, squirt a small amount of Animal ID Tag Cement onto the Infrared SOLAS Tag and place on the upper shoulder(s) of the animal. This placement should be out of the animals biting range to prevent them from chewing off the tag. For best results use a tag on both sides so you can see a tag regardless of which way the animal is facing. Infrared SOLAS Animal ID Tags come plain, numbered and custom printed. Numbers are large enough to be seen at a distance with night vision and infrared cameras. Custom printing can provide contact information in case an animal is captured or found. 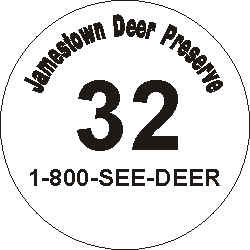 Numbers and contact information are black so only persons with night vision or infrared camera can see them. The 1.14" Tags come in sets of 24 tags. The 1.75" Tags come in sets of 48 tags. Permanently Numbered ID Tags are Screen printed. We use solvent based screen printing inks which will not scratch off or fade. 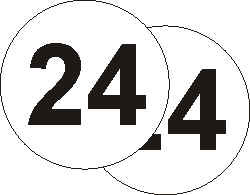 Numbers are black so only persons with night vision or infrared camera can see them. Even if the tag falls off the animal and is lost in the woods it can be found and still read for years after it is fallen off the animal. Permanently Numbered ID Tag Sets come with two of each number. We can also print custom information, such as your organization name, contact phone numbers and web address. Custom Information is black so only persons with night vision or infrared camera can see them. 3M Brand SOLAS (Safety Of Life At Sea) is approved by the U.S. Coast Guard as a retroreflective material used to enhance visibility of life saving equipment in nighttime, or low light conditions. 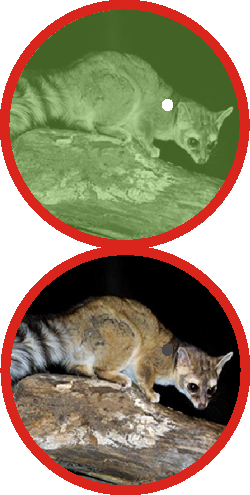 3M brand SOLAS reflects brightly when viewed with night vision equipment providing crystal-clear animal identification. Magic Black Infrared Ink. Magic Black is made and developed by Anytime Sign. We regulate the quality and thickness for ultimate opacity in the visible spectrum. In the infrared spectrum Magic Black becomes transparent allowing for the 3M SOLAS to reflect light back to Night Vision equipment, providing crystal-clear animal identification. Polyester Top Coat. Infrared Animal Id Tags come with a standard Matt top coat to cut down on possible glare in the visible spectrum. The matt top coat is screen printed durable Polyester. In addition to cutting down glare the Polyester top coat provides protection against scratching, and prolongs the life of your tags (which take a lot of abuse).